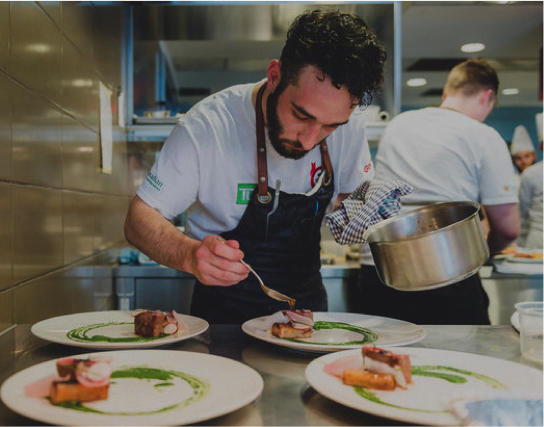 A panel of Canada’s top chefs has spoken and announced the culinary finalists from Calgary’s regional heat of the Hawksworth Young Chef Scholarship presented by TD AeroplanVisa Infinite Privilege. The competition was extremely fierce during the Calgary heat on Saturday afternoon, with only two young chefs able to progress through to the final national round, which will take place on September 12 in Vancouver. Regional heats are held in Vancouver, Calgary, Toronto and Montreal. Each competitor was given identical ingredients, provided by Gordon Food Service Canada, and allowed two hours in the kitchen to wow the taste buds of the judges. Those who came out on top were from a diverse group of talented young chefs from a number of the city’s top kitchens. The Calgary heat finalists are: Sean MacDonald (from MARKET Restaurant) and Ian MacDougall (from Model Milk) who stood out ahead of the competition to win over the judges. “As we enter our third year and this contest grows larger, we see more and more top calibre applicants from cities across Canada, making the talent pool increasingly more impressive and the competition tougher,” says Chef David Hawksworth, the founder of the Hawksworth Young Chef Scholarship. Sean was first overall in the Calgary heat, impressing the judging panel that included Chefs Michael Allemeier, Michael Noble, Connie DeSousa, Justin Leboe, Kristian Eligh, and David Hawksworth. His well-composed dish of onion milk sous-vide eye of lamb short loin won over the esteemed panel of judges. Chef Kristian Eligh noted, “His laser precision in the kitchen, complemented by great technique, made for a clear winner.” As a reward for Sean’s hard work in the kitchen, Le Creuset provided him with a Stainless Steel Chef’s Pan (Saucier). Taking place at Vancouver Community College in September, the final round of this national competition will see the finalists use mystery ingredients from a black box, revealed only moments before the competition clock begins to tick. The winner, chosen by a prominent panel of Canadian chefs and food critics, will be awarded a $10,000 scholarship along with an international stage.